B#Sharp Entertainment is YOUR Wedding Reception Specialist! 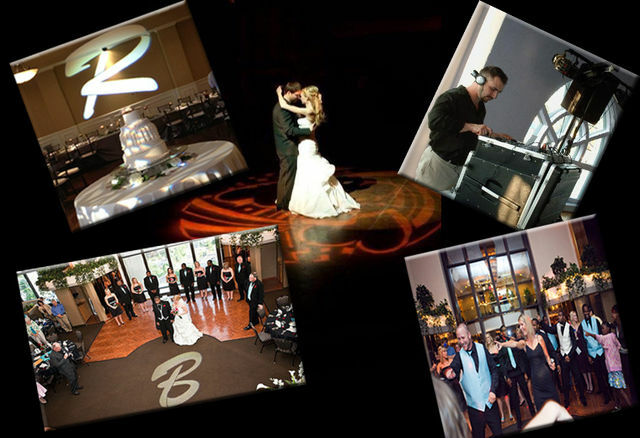 Thank you for considering B#Sharp Entertainment for your wedding reception entertainment! Our consistency in DJ performance and talent and personal service is what sets B Sharp Entertainment apart from our competition. 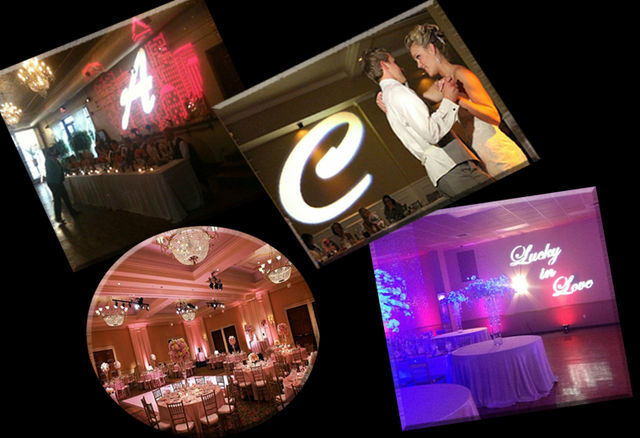 We offer monograms and personalized spot lighting, flush lighting, up-lighting, full room transformation lighting, gobo lighting and professional dance floor lighting. The very best music experience for your wedding! If you are still looking for the perfect venue or even a great place for your bridal shower or rehearsal dinner, please visit Affinity Riverside Estate. Also, come to our monthly Taste and Tour at Affinity Riverside Estate. This is a fun night to get some wedding planning done, visit with DJ’s from our professional team, plus you can check out our photo booth! Lighting is a very unique and inexpensive way to get a wow effect in any venue! who actually makes personalized messages and monograms to shoot on the wall or on the dance floor. The Wedding Collection is a full service one-stop wedding shop! Are you or is someone you know having a wedding reception? Here are a few suggestions from the professionals at BSharp Entertainment. Aside from our “Top 10”: Looking at the overall cost of a Wedding Day, the professional DJ fee is a small percentage of the total price yet NOTHING can affect the entire outcome of the day like the party portion and the Entertainment provided by the DJ/MC you choose. Ask anyone who has been to a wedding what they remember…not the flowers, centerpieces or table covers. They remember the PARTY. It’s not just music; it’s the overall presentation of the most important party you will ever throw. NEVER choose your DJ based on price alone, and never “replace” a professional service with an iPod. If corners must be cut, don’t compromise the party. BSharp Entertainment clients never complain that they paid too much for our services. In fact, most of our business comes from word of mouth and recommendations from past clients. 9) Your guests should NEVER start eating before you arrive! Before you arrive, it is appropriate for guests to be encouraged to mingle and have a cocktail or drink! The buffet should open with you, your family, and head table. That way, you will be finished eating before your guests are. We then start the “Traditional wedding events”, which are excellent dinnertime entertainment for your guests! If the buffet opens before you arrive, your guests will be in line for your grand introductions and must wait on you to finish eating. This will cause dead time as the “Traditional wedding events” would need to be pushed back, causing you to feel rushed. 8) Don’t put your entertainment, bar and/or dance floor different rooms—your entertainment should be centered. Powerful entertainers will work to get people on the dance floor but they must be in the action! If the dance floor is too far away from the action, it becomes more difficult to get people to actually move to the dance floor, and very hard for your DJ to interact with the guests! Bars are like kitchens—they draw people to them. If you can help it, don’t make your DJ wrestle with the draw of a bar. 7) A “too small” dance floor is better than one that is “too big”. Why? The answer is simple: It creates the impression, whether real or not, that the floor is full. People are more likely to dance when the crowd on the floor is dense than when they feel like there only ones out there. Take it from the pro’s who know about dancing and crowd psychology! If people end up dancing on the carpet…great! They end up dancing on the carpet and the story of your floor being so packed people couldn’t even fit on the floor only further reinforces this point. 6) Darker is better than lighter for dancing. People feel like less of a spectacle, less “on-stage” when they think they’re harder to see. That’s why crime increases at night as well—and yes when some people dance it is a crime. This one works along the same lines of psychology as tip #7. Also, our lighting will create a very professional atmosphere! 5) Do a dollar dance only if you have a PLANNED honeymoon… And Theme it!!! Do it early on after the first dances and limit it to around 15 minutes! On the Plate…Remember, there is about 2 hours of setup before your music begins, a 5-6 hour reception, followed by an hour take down. Nine hours without food or water is very difficult for even the most diligent DJ! Bringing a lunch box is tacky…AND OFTEN NOT ALLOWED BY THE CATERING HALL! We would never sit down at a table and eat a full meal. We do appreciate the invitation to the buffet so that we may discretely eat when we get a free moment! Besides, I can tell you from experience that professional wedding vendors will gladly do a little extra for you at no charge when you treat them right, and they are comfortable…and not eating for nine hours is NOT comfortable! On tipping? Your actual DJ is in a service profession and is only getting a portion of the amount you are paying for your DJ service. There are several people that are being paid out of that total amount who are responsible for putting the party together for you! If your DJ does an excellent job a tip is customary and appreciated, however never required. As a guideline $25.00-$200.00 is the norm. 3) Your DJ/MC should be hired for the entire reception. A strong and grand introduction helps build rapport early on. When done right and with energy and enthusiasm, it puts the DJ in a professional position to work your crowd all night. Let your DJ/MC control and announce the flow of the night! We have the experience necessary to professionally keep the evening flowing! A good DJ is an on-site reception coordinator! 2) If you want an evening reception where your guests stay longer than an hour after dinner and dance the night away, you should offer a bar. You do not have to pay the bill for an open bar; a cash bar is acceptable. If the concern is offending grandma and grandpa, there are tricks we can talk about that will respect them, yet allow you to have the party you want and have paid for! A) You, your friends, and your family DON’T drink, but like to dance anyway! Now, if it is a situation where you and your friends like to drink, but not so much your family…you have to consider who is paying the bill and hopefully come to a compromise since it is your wedding! B) If you actually only want an early or afternoon reception with ALL the traditional events, but without a full dance, in the end, you may or may not want to serve alcohol. Early receptions can be very nice, and quite charming! An afternoon reception will ensure that you actually get all of the attention a full reception offers and will leave the evening open for your guests to enjoy other plans, and for you…an early start to the honeymoon! 1) When hiring a Professional such as BSharp Entertainment, you should rely on their musical expertise. Remember, we do this for a living and have experience with every kind of crowd you can imagine! We WILL play your special requests, but be careful not to cut out all the “cliché” wedding music as we find that this always negatively impacts the dance floor potential. People dance to what they know. A wedding reception is not the time and place to prove to your friends and family that you’re into obscure music. You’ve got a lot of people from all over your family tree that want to have a good time, so trust your DJ to read your crowd and exercise all of his/her tools and really work his/her craft! A good music mix is the rule for all wedding receptions! This was brought to you collectively by the DJ/MC’s of BSharp Entertainment.